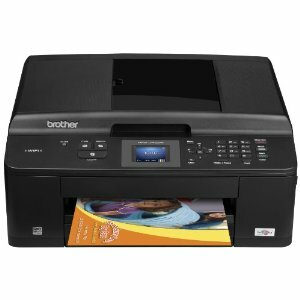 This compact, easy to use All-in-One allows you to print, copy, scan and fax and is ideal for the small or home office. Its stylish design with patterned lid will complete your modern office. Share with multiple computers on a network using the wireless (802.11b/g/n) network connection. Unattended fax, copy and scan up to 20-page documents using the automatic document feeder. Fast print speeds of 33 ppm black/ 26 ppm color (Fast mode); ISO standard 10 ppm black / 8ppm color (ISO/IEC 27434). Wireless printing from your mobile device via: AirPrint, Google Cloud Print, Brother iPrint&Scan, and Cortado Workplace. Only change the ink cartridge that needs replacing with the convenient, 4-cartridge ink system. PPM speeds exclude time to complete first page and will vary depending on a variety of factors. For more information about print speed methodology, see the Brother website for details.